Cet Law will be at Lauderdale-By-The-Sea to celebrate with many other organizations our ocean! The event, organized by SeaWatch on the Ocean and Stoked On Salt – SOS Ocean Clean Up, invites the community to enjoy a free, family day to learn more about our Ocean environment and participate in a Shoreline Beach Cleanup to help preserve and protect our living coral reef ecosystems. Over 20 Ocean/Marine Conservation Tables will be set up on the grassy lawn just steps from the ocean! We will be providing each person with a free Canvas Tote to fill with outreach and educational materials, brochures, pens, stickers… as you visit table-to-table. The day will focus on CORALS – MANATEES – LIONFISH – BEACH/OCEAN DEBRIS – SHARKS – SEA TURTLES – MANTA RAYS WHALES – DOLPHINS – LOBSTERING – MARINE CAMPS – FISHING REGULATIONS and more. Parking: Free Parking. Park in the SeaWatch parking lot or across the street at the Assumption Catholic Church parking lot. Event: Free event and open to the public. Live steel drum music. We encourage you to promote the event to all ocean lovers ! 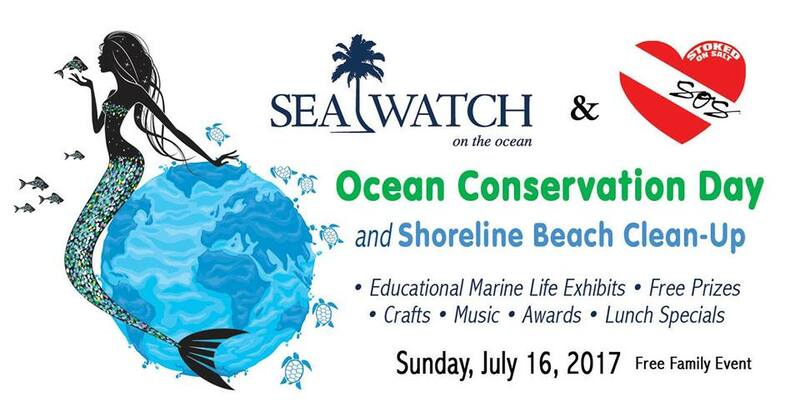 Food & Drink: Will be served at SeaWatch and 25% off Lunch will be awarded to each Shoreline Clean Up volunteer. Simply bring the beach debris to be weighed to receive the wristband.